Beacita is a medicine used for lose weight in overweight adults. For every 2 kg of weight lost with diet alone, Beacita will help you lose 1 kg. Orlistat, the active ingredient of this medicine is a compound that inhibits the absorption of about one-quarter of the fat ingested in the diet. This unabsorbed fat is eliminated with feces. Each capsule of Beacita contains 60 mg of Orlistat. You must follow a diet low in fat and calories while using Beacita. This way you get to lose weight in less time while minimizing the effects of diet-related treatment (due to the removal of fat in the stool). Beacita should only be used by people with body mass index (BMI) greater or equal to 28. 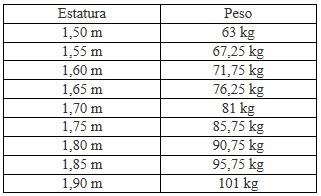 See the table below, if your weight is lower than the weight shown next to his stature should not use Beacita to lose weight. 1 / Choose the date you begin using Beacita. Start a diet low in fat and calories few days before to accustom the body to the new diet. 2 / Then set a target weight loss. Decide how much weight you want to lose. A realistic goal would be to lose between 5% and 10% of their initial weight. The amount of weight you lose may vary from week to week. Try to get regular weight loss of about half a kilogram each week. 3 / Set up fat and calories ingested per day. You can get more information referring to "more useful" in the prospectus. The recommended dose is 1 capsule of Beacita 3 times a day, just before, during or up to 1 hour after breakfast, lunch and dinner. In the event that any of these three meals or if any of them do not eat fat it will not be necessary to take the capsule. Do not take more than 3 capsules daily. You should drink a glass of water with each take of Beacita. Try to maintain some physical activity before, during and after treatment with Beacita. If you have not lost weight after 3 months of treatment, consult your doctor or pharmacist. You should not take this medicine for more than 6 months.